It's kind of embarrassing, as small as it is, that I have been sitting on this since late June or early July. The old cat blankie that we've been using is practically threadbare and I thought the baby would like a new one. It's made with leftover strips of fabric from the original ORBC quilt along, I thought great- a good way to use some of them up. So I made the top and there it sat, blocking my view outside by hanging on the railing upstairs between me and the balcony, glaring at me, making me feel guilty for not finishing it. I decided yesterday afternoon to put myself out of my misery and in just a few short hours, it was done. I cheated this time and stitched the binding down with the machine. 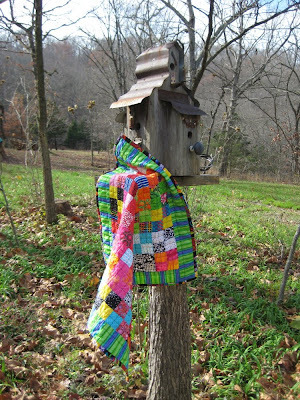 I just couldn't bear hand stitching another binding so close on the heels of the Hooters! quilt. Nosey Parker thinks it's a great place to hide while hunting wiggling leaves! The backing is some Free Spirit yellow ribbon flowers fabric by Denyse Schmidt that I found for a whopping $2.50 a yard, that was a shopping coup! The binding is a coffee cup stripe fabric by Barbara Tourtillotte that I bought ages ago and didn't really care for as a big piece of fabric. Cut into 3" strips, though- it made a great binding for a colorful little quilt. 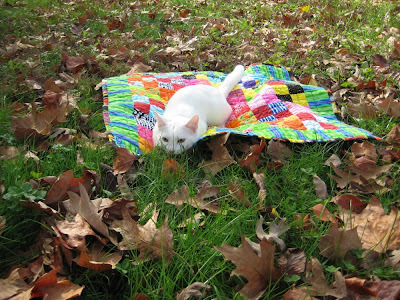 Oh don't know what I like more - the colours on that quilt, the autumn leaves behind or that cat! I love this style of ickle squares quilting. Your colour drifts really nicely - that took some planning, aye? Wahoo... I saw your link on sew mama sew!! Congratulations! What a pretty quilt. I wish I were laying next to NP watching those leaves fall. 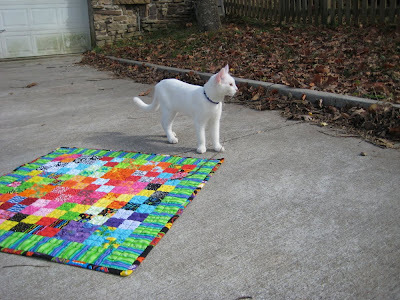 The colors of the quilt are so interesting, they look different from the two views. I really like that. Great job Flossie. I wanted to congratulate you on your award as well!! Good going! 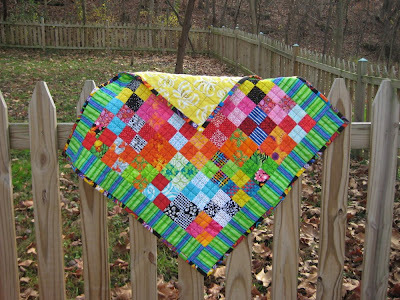 I looked at all the quilts and to me you are a very deserving winner. I can't believe the beautiful creations you've turned out in your short quilt "career".